Despite losing its traditional firearms market in the U.S. last year, the Kalashnikov Concern is not only actively seeking to diversify its distribution markets but is also upgrading its production facilities and looking for new niches for itself. 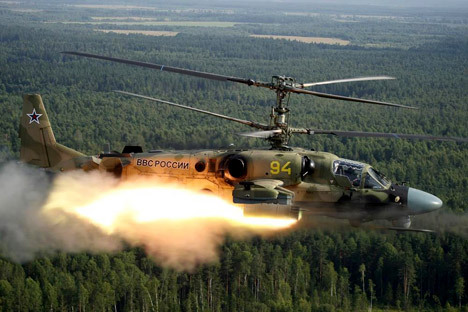 One of the arms manufacturer’s latest projects is the production of guided missiles for attack helicopters. After the events of 2014, one could have expected that Russia’s iconic weapons manufacturer Kalashnikov would be experiencing difficulties maintaining growth in the new economic conditions. Yet despite losing its key firearms market in the U.S. as a result of sanctions (imposed by Washington over Russia’s role in the Ukraine crisis), the Kalashnikov Concern is rising to the challenge: Not only is the firm actively courting new markets, it is also diversifying its production. In February 2015, the company announced the launch of two new projects: the production of unmanned aerial vehicles and motorboats for military and civilian use. Meanwhile, as part of the state defense order, Kalashnikov manufactures Vikhr-1 guided missiles for the Russian Defense Ministry (in 2013, the tender for the production of these missiles went to Izhmash, which forms part of the Kalashnikov Concern). The first deliveries of these missiles, whose production volume is estimated at 12.5 billion rubles ($225 million) will start in 2015. The Vikhr-1 is a guided missile with foldable wings based on the canard-controlled missile configuration and is designed to hit armored vehicles and air targets at low speeds (under 800 kph). The supersonic missile, which is mounted on attack helicopters as part of the Vikhr missile complex, takes just nine seconds to reach a target 4 km away, travelling at a speed of 610 meters per second. The tactical and technical characteristics of this missile (which, incidentally, are superior to its U.S. equivalent, the AGM-114R Hellfire, which has lower speeds) allow a helicopter equipped with these missiles to attack multiple targets at once and improve its probability of surviving an encounter (the helicopter quickly fires and leaves the scene). The missile is fitted with a smart guidance system and an automatic “fire-and-forget” tracking system. The pilot spots a target on the thermal imaging screen, “captures” it in the sights and activates the automatic tracking system. Once the target is within range, the system launches a missile. This system ensures high accuracy of fire. In addition, its laser beam guidance system has low transmission power and cannot be detected by enemy radio-electronic equipment. The production of Vikhr missiles for the Defense Ministry is the company’s only state order so far. Contrary to media reports that the AK-12 assault rifle has been selected to form part of the future-generation Ratnik combat gear, the weapon is still undergoing trials and there have been no official announcements regarding a large Defense Ministry order for the assault rifles. Meanwhile, the Kalashnikov Concern is offsetting the low volume of the state defense order by making adjustments to its marketing policy and pursuing a policy of expansion into the Asia-Pacific, African and Latin American markets. “In 2014, Kalashnikov for the first time in the last seven years secured a net profit and nearly doubled its production of firearms, to 120,000 units,” said Kalashnikov Concern managing director Alexei Krivoruchko. Maxim Kuzyuk, managing director of Technodinamika, which forms part of the Rostec state corporation, pointed out that the weak ruble had boosted global demand for Russian exports: “The depreciation of the ruble has made our manufacturers’ products more competitive. The reason is an 80-percent depreciation of the ruble against the dollar,” he said. Kuzyuk added that Russian defense industry enterprises should take advantage of the difficult economic situation by curbing production costs and increasing export supplies.